Love, true Christian love, is the only balm which will ease the pain. It will not cure it and it won’t take it away, but it helps…a little. Just show them that you love them. It doesn’t take much and it doesn’t cost you anything but love is the only ointment which can begin the healing process. God’s love can and will heal it in time, but a friend showing love to a brother or sister in Christ is felt immediately and in a physical way. No amount of food or money or any physical thing helps more than the love of Christ. I am posting this because I know there are many out there who are hurting from the loss of a loved one, regardless of the cause of the loss. God loves you and He is always by your side to comfort you. Grief is what you feel when a person is not around to share the love that you have for them. God loves us so completely and totally without reservation until He sent His Son, One of the Trinity, to pay for ALL of mankind’s sins. Not just those which had been done by Israel or those from centuries in the past, but for ALL of mankind until the end of the age of man. Love is the factor which brought God to Earth in the form of a man, Jesus the Christ. We receive His grace every day with our life as we wake in the morning when we are bound to Earth by the gravity which God placed into creation or when we breathe the air given to us by God and recycled by the plants and trees and chlorophyll-laden plankton in the ocean. God provides for us in so many ways until we have come to take all of them for granted as if we have a right to them. We do actually, as long as we are in love with Him too. But when we burn the forests down or pollute the oceans and streams which He gave to us to manage but not destroy, God doesn’t look kindly on us as part of His creation, which was made in His Image, while it destroys other parts of creation. God tells us in His Word, the Bible, that He loves us. He does this so many times until it should register with you and me without it being pointed out by a preacher or someone who has taken the time to chronicle the number of times it shows up in the Bible. The numbers are not exactly staggering but they do show that God wants us to know that He LOVES us! It depends upon which version/translation that you use to track the number, but if you use the King James Version there are 310 times in which it appears. Some translations use the word in ways other than what love should be used for but the fact is that God expressed His love for all of us through His grace and mercy and all of the blessings which we have in our lives. Yes, we do take most of them for granted today and most of the world doesn’t notice any of them as being given to us by God at all. The air we breathe, the water we have to drink, the food which we have are all part of our inventiveness and our own work. Much of the world doesn’t attribute any of our accomplishments to God at all! It has all been done by the ingenuity of our minds and our talents. Who gave us our talents and our intellect and ingenuity? God did. Yet, we treat our talents and our intellect as ours, as if we had a part in bringing it to bear in our lives. God gave each of us unique talents and abilities which only we, as individuals, have in our possession. While a degree or a talent for music may be shared in the general population, each person has some unique talent or ability which no other person in the world has. So why do we seem to think that “natural selection” made such a difference in the world? Because of the scientists and legislators who have pushed God and any mention of Creation out of their curriculum. That is the reason most colleges graduate people who have no concept of God because He isn’t allowed in the classroom! So why would God bless our country so much when we have pushed Him out of schools and out of our government or public life? There is really only one reason which explains why He has not taken His blessings away from America. He blesses the land which has blessed Israel and our country has done that. While it is true that a few others have blessed the land and the people that God holds dear in His heart, America has done it for the longest amount of time. God is still active in Creation, whether we recognize His hand in it or not. The world is His and everything in it is His to do with as He pleases. So, forget the political processes and the parties, the Ruler of the universe is truly in charge of each facet of life here and we should be following Him as closely as possible every day. God provides for us, collectively and individually, everything that we need. Yet, we worry about things which usually means we are worried about something which we rarely have control of anyway. His love and His presence are available all of the time because He never leaves us, but if we don’t practice our prayer life and being aware of Him we will feel as though He isn’t there. In your daily life, you can see the evidence of Him all around you. In the clouds and the trees and the wildlife which you see during the day and in the sky with its stars at night! He is present in your child’s laugh and in a baby’s cry. God is in and around you whether you actually believe in Him or not, but He wants you to know Him and He wants to know you better too. Whenever you feel His Presence, answer His call in your life and in your heart. Why? 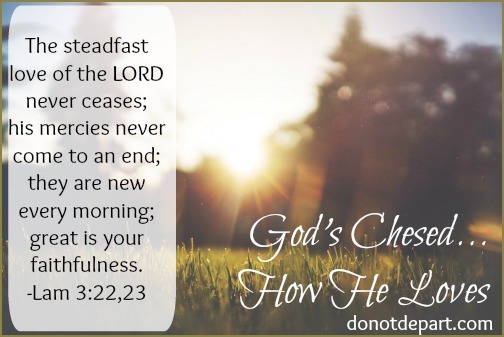 Because He is devoted to your life and your well being, no matter what you may be going through…even if it is stage 4 cancer or a horrible accident. He is there to give you strength and healing if that is His will for your life. Sometimes He may use your death for a purpose which you don’t know about yet, but if you belong to Him then you will see the outcome when you are with Him. Every good thing in life comes from Him, every bad thing is allowed to happen because there is something good which will come from it. Just as the time when Jesus delayed coming to Lazarus‘ side when he was ill, there was glory and honor to be given to God the Father because of his death. If Jesus had come before he died, He could’ve healed him of his illness, but a greater glory was shown because Jesus called him from the grave after four days. 41 Then they took away the stone from the place where the dead was laid. And Jesus lifted up his eyes, and said, Father, I thank thee that thou hast heard me. 42 And I knew that thou hearest me always: but because of the people which stand by I said it, that they may believe that thou hast sent me. 43 And when he thus had spoken, he cried with a loud voice, Lazarus, come forth. 44 And he that was dead came forth, bound hand and foot with graveclothes: and his face was bound about with a napkin. Jesus saith unto them, Loose him and let him go. I have wondered about this many times in my life. I have even asked myself, “Just how broken am I?” The answer never really becomes clear most of the time and after a while, I forget I even asked the question. Brokenness is being spiritually cracked in ways that medical science can’t detect. It is not a state of being which many people will be able to see in you most of the time. Although, they will detect it if it gets really bad. How can we, as Christians or even non-believers, fix our brokenness? Well…on our own we can’t. You may try different things like drugs of different kinds which will lead to being broken on a different level altogether. You could go to a psychologist or some other therapist to attempt to find the reason for it and possibly find a “cure”. But the problem lies with your soul and whether you are a believer or not you can feel and truly be broken. Sometimes it happens when a loved one dies or a business deal goes sideways. Anytime something else is placed in a higher position in your life than God, a crack forms. The longer it stays there, it will keep growing and causing more cracks to form. Satan knows this and he will keep adding to the illusion that you are doing really well, keep up the good work. But, the problem is that you are doing his work for him. Unless you can discern where or why the crack in your life began, it may never be fixed or rather you may not want to get it fixed. God can and will give you the ability to fix it but only by acknowledging that you need Him and His Son in the place of whatever you have above them now! This is not one of those times to go it alone because that is how you got here in the first place. We all think that we can handle our problems all by ourselves when the truth is that we can’t. Living your life as if you are in control of every part of it is foolish and until you realize that small bit of wisdom…you will keep on making little mistakes which will add to your broken state of being. God can get you back on the right path in your life but only if you will allow Him to do so. He doesn’t push Himself into your life nor does He force any of His ways into your daily living. Love doesn’t force and cannot be forced on anyone, that is the message in the Bible and it is His message to all of mankind. God’s love is above all of our ideas of love and it cannot be undone once you realize you have it. It is your choice to follow His lead in your life, one step at a time and one day at a time. During my life, I have seen Christian attitudes change. Sometimes for the better and sometimes for the worse, but the love of God is for everyone, regardless of your nationality or creed. This is the message that Jesus taught and it is the same message that all believers in the world should be taking to the rest of the world today! Why should we do this? Because Jesus would do it if He was still on Earth doing His ministry today and that is why we are supposed to take His message to ALL over the world! There is no reason that we should not tell others about our Savior, regardless of where we might go or who we are talking to. Everyone needs Him, regardless of their religion or their doctrine and they need to make that decision today. Why? Because today could be your last day on this Earth. We are not guaranteed tomorrow, so seek Him and believe in Him today! Your salvation and your eternal destiny depend upon your decision here and now. Once your life is over there is no second chance to make it right. Make sure of your salvation now while you have the time. It helps you to maintain your mental health, (according to Dr. Paul Meier) Prov. 4. What then is the best translation of the Bible? I agree with Dr. Kroll. The best translation of the Bible is the accurate translation of the Word of God that you will read and obey. Reading and studying the Bible does you no good at all IF you don’t obey God’s Word in the things which it tells you to do. Some people think that the Bible is a book of “do’s and don’ts” but it isn’t. Yes, there are the Ten Commandments and they tell you the things which you are supposed to do and some tell you not to do others. The point is this: when your heart belongs to Jesus and the Spirit lives inside you…you won’t WANT to do those things which are the “not do’s”! God loves each of us more deeply than we can understand, even when we are in His presence we will be overwhelmed by His Love and the depth of it! Don’t turn away from a love that is so awesome and joyful until it feels like a warm blanket that never gets cold and you just want to snuggle in it forever! That is the best description that I can give you of the love that I have felt here. I can’t even imagine what it will be like to sit with the Father and feel the waves of joy and love flowing from Him! Seek Him out and we can experience it together in eternity! There have been many protests concerning certain lives matter, whether they are Black, African-American, or even White. Come on, God created Life! Your life, my life, and every person who has ever lived on this world, all of our lives matter to Him! The color of your skin or your ethnic origin is irrelevant to God. Slave or freeman, Muslim or Protestant or any religion in the spectrum, God loves you! So, yes, life matters to God…every life! We, humanity, have put limits and regulations and stipulations on which lives matter and which ones do not matter, at least to us. Why should we compare and claim that my life or your life matters more than any other? A baby being aborted at a clinic could possibly be the person who finds a cure for cancer, but if they aren’t born and allowed to grow toward that potential we will never know. Someone being killed in Turkey or Iran or Syria might also be important to the peace cause in the future, but we will never know for sure. Lives matter every day, not just today but every day in our country. So many are hurting this morning because of the actions of one person or a few people who are targeting people for the color of their skin. It is heart-wrenching to see this happening in our country when racism should have become a thing of the past. Yet, every time it seems that we have a handle on it, someone from one ethnic group or another will blow a hole in it and begin the process all over again. I don’t write this in the sense that I am some perfect Christian because there was only One perfect man ever on Earth and He is Jesus. My ideas are that we should get along, but in the society that we have today, in America and around the world, it is not possible. Humanity hasn’t evolved to the point of getting past old hatred and wounds from decades past. We just don’t seem to be able to let it go. Every time healing begins, someone pulls the bandage off and starts it over again. This needs to stop but without prayer and cooperation between those with different tones of skin color, it won’t get a foothold or gain any traction. God loves us and we were told by our Savior to love one another, but it seems that we haven’t truly figured out what that means yet. We don’t understand the meaning of the word because we have watered it down and changed the meaning of the word “love” so much until it really doesn’t convey the same emotion that Jesus was telling us to express toward each other. Seek out the Lord in your life and follow Him. Why do I say this? Because if you follow the Author of Life, you will be more alive than you ever have been. You will also learn to be more loving and if you love others as Jesus loves you, then you will not be like those who are causing all of the division and hatred in our world today. Jesus came to bring eternal life to all of us, all we have to do is accept it by faith and ask His forgiveness. Being a Christian is not something which can be forced upon someone, just like you cannot force someone to love you, but if you have felt that you need Him at all, then all you have to do is ask Him to come in and cleanse your heart and to accept you as His child. Why did I place that as a question? Because, many people don’t realize that they are actually seeking Jesus. We look for all sorts of things and people and even careers or money to fulfill our lives and make us feel complete and yet none of those can do it. Sometimes each one can fill in for a little while…but not for long. We tend to look for things which will make our lives feel better in some way and most of us don’t realize that the part of our heart or our being which needs filling only needs Jesus. He is the only Person..the only real person who can fill that area in our life! We feel an emptiness at some point in our life and yet we don’t know what or who should be there…until we find out about Jesus. Some of us find that we truly need Him early in our life, and some of us don’t realize that we need Him until many years later. Sometimes it may be at a time when we are in need of Him in more ways than for salvation. We need a healing or we may be nearing death from cancer or if we are on death row in prison, we may seek Him because we are afraid of going to Hell. There are many reasons why people seek Jesus, but the one which brings you to Him is your realization that you are a sinner and that you need Him. Not only that but we are not guaranteed tomorrow morning or even tonight, so what would you say to God if you were to meet Him this afternoon? In reality, you couldn’t say much because He will show you when and how many times you have heard the gospel preached and you didn’t respond. All of your life will testify against you, every word and deed and action that you ever did will be brought forth, and there will be no excuse because you won’t have one. Standing before God the Creator of all things, you will not be able to mount a defense of your life because He already knows you and all that you did or said during all the days of your life. You cannot hide from Him and you cannot reason with Him because your performance in this life gets you nothing! Only the acceptance of Jesus as your Savior will bring you into the gates of Heaven. Before your life ends, please ask yourself this question: “Where do I want to spend eternity?” No matter how long your life is here, eternity is a lot longer so make sure before your last breath. If we claim to know Him, we should live, walk and act as He would. Knowing Him is more than simply quoting scripture and going to church. It’s actually living the Word as life unfolds day-to-day . Sometimes we just take things for granted, when we really need to be sharing what we know…. and the very best place to be is ……..
God Smiled on You Today . Jesus is our Life, our eternity and the Life that takes us into it, so why are we ignoring and ridiculing each other and the message that is in the Bible? Because many people just don’t want to hear the message and the hope that is contained in it and in the message which Jesus brought to us. We need it…all of us, but there are many who think that there are too many rules or they look at our religion as one that has caused oppression, slavery, murder, and many other abominations toward life. Religion has caused many of these evils in the past, and regardless of the religion that was involved many of the evils committed were laid at the feet of Christianity. Christianity is a religion and many people do practice it under the guise of different denominations but being a Christian is a LIFESTYLE in which you live and walk with Jesus DAILY, not just on Sunday or Wednesday. There is a huge difference between religion and those who practice it in all of its forms and a true Christian. Just as there is a difference between people who practice Islam and those who actually live by the good teachings of it and those Islamists who practice and live by a form that their Prophet would not recognize were he here. God, not Allah, is the answer to the world’s problems today but many people don’t want to hear that because they believe that they have the answer and their’s is the only answer regardless of your beliefs! You can become radical about anything…money, power, religion, or any of a dozen other things but being radical about it doesn’t make it the Truth of God! Why am I saying this today? Because the world is quickly moving in a direction which will lead many people toward a destination which is not the one that they are hoping for. Many religions in our world today take you down a path that is easy to walk and with many things promised to you, if you will just give your life to the teachings of the prophet or the leader or the doctrine being taught. If those doctrines and wisdom don’t come from God and His Word…RUN! Get away from that “church” or “temple” because they are teaching Satanic wisdom and doctrine, and you will pay eternally for it! Life only comes through the Creator of Life, Jesus the Creator. He is called the Door, the Way and the Life in Scripture and it is through Him that we have access to eternity. Not with our own abilities or our accomplishments, even though we are given those and the ability to accomplish them by Him. You and I cannot work our way into Heaven. It is gained by faith and belief in Jesus. Belief in Jesus comes to each of us by our faith and faith comes from hearing the Word of God, whether you read it yourself or you attend a church which teaches from the Bible! Life is not just an existence and it is not a drudgery and terrible way of living, regardless of where you live or the system of beliefs that you live by. Life is truly what comes to you from knowing Jesus and His Love in your life, daily! Seek Him out in your life so when this life comes to an end, your Life in Him will truly begin!